GB Tell me about your lockets. FB My mum wore the silver one all the time when I was a kid but then someone told her it was Art Deco and because silver is so soft she stopped wearing it in case it got damaged. When I was about 23 I saw the gold one in the window of an antique shop and flipped out. I went home, got my mum and the silver one from out of the safe and we returned to discover that they exactly the same piece, so I had to invest! My mum has since given me the silver one which I’m saving for a special day. I think gold and silver worn together is beautiful. 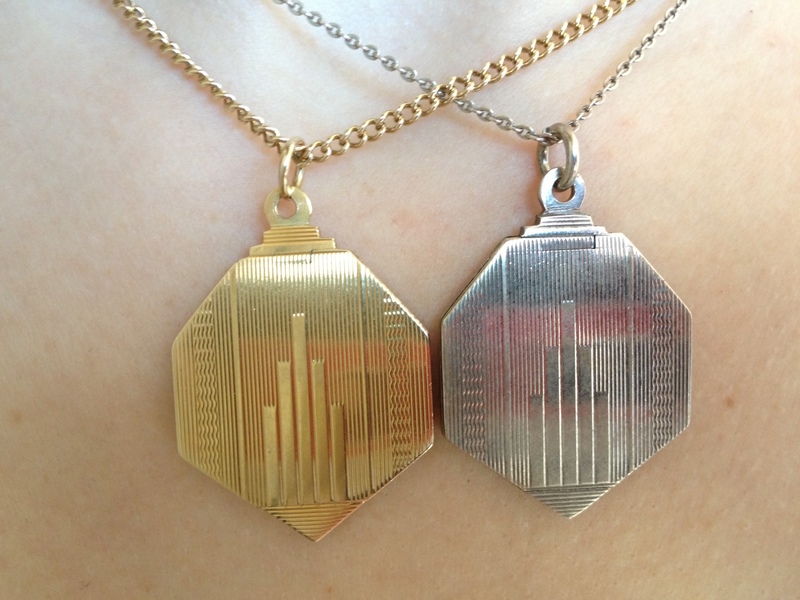 I also think this locket is my idea of beauty because it’s reminiscent of the Chrysler and I love the geometric designs from that era which I think inform my aesthetic. There are other reasons. It’s almost a secret locket because it’s so slim and streamlined it looks like a pendant and no one knows it conceals something. Lastly, I love that it’s a magnet for interesting people by acting like a barometer of character when I first meet someone. It’s the special people that notice and enquire about it. GB Do you wear yours every day? FB Yes, I don’t really like traditional fine jewellery, but there’s something perfect about this. I’d feel naked without it. GB Do you think women that wear your own designs now, like Lady Gaga, are rebelling against traditional views of female beauty? FB. Yes, I’m very influenced by Leigh Bowery and I want to make things that are thought provoking. But at the same time I think it’s important to connect, not to be too scary or unattainable. GB Does the word beauty ever come up in your working environment? FB Not much, but it will do in the future! This locket has been a reference in my new Spring Summer collection. I think it started subconsciously but there’s a lot of gold and hexagonal shapes in the collection. FB For me it’s something uplifting. In a person it would be a captivating style and energy. In an object I’d look for something positive, fun and colourful. I think colour is important in generating vibrations. Each colour has it’s own properties. I like the theory that you wear yellow or orange for healing, blue if you want to feel peaceful, red if you want to feel energetic and powerful.